One of the most common ways to celebrate a birthday is by hosting a birthday party. And, whether the event is for a family member, a friend, or for yourself, you need to make sure that you are also creating corresponding birthday invitation cards to let your friends and relatives know about the event. After all, what is the use of commemorating your natal day if you do not spend it with people you love? In this article, we provide different tips on how to glam up your birthday invitation cards by using chalkboard designs. More information about this latest design trend will also be discussed later on and multiple examples of downloadable chalkboard birthday invitation card templates are embedded throughout this article. As promised, embedded below and scattered all throughout this article are examples of chalkboard birthday invitation templates. All of them bear distinctively creative card designs that anyone may use for whatever kind of birthday celebration theme you wish to follow. Also, note that all these invitation card templates are downloadable and customizable as Adobe Illustrator or Photoshop template files. How to Create Chalkboard Birthday Invitations? 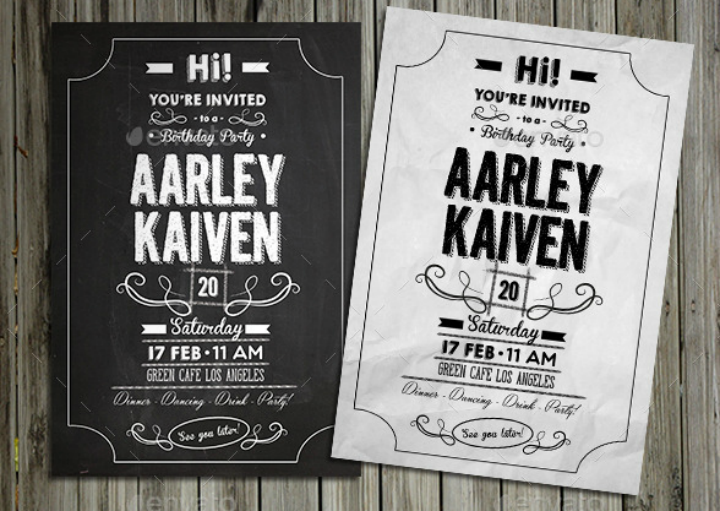 One can easily deduce that chalkboard birthday invitations are invitation cards that incorporate chalkboard designs. These designs tend to mimic the appearance of a school blackboard or chalkboard. It will also include graphic design elements like chalk font styles, childlike handwriting fonts, and simplified illustrations or vector designs. There are two main ways on how to create a chalkboard card design for your birthday party invitations. The first method is done by hand and is more popularly known as creating handmade card designs. The second method is done through the use of pre-made invitation card templates. Each method has its own pros and cons which will be further discussed later. If you want a more intimate birthday celebration or if you want your birthday invitation cards to truly showcase your own creative personality, the handmade invitation card-making route is the way to go. With this method, you are free to design all the elements of your birthday invitation card from scratch. Chalkboard invitation card designs also appear more realistic when you use real crafting materials to create the invitation card cover. Also, you are free to incorporate any design elements into your card canvas. A major downside with handcrafting birthday invitation cards is that they take a lot of time and effort to make. We advise that you choose this card-making route if you have enough time and patience to create each handmade chalkboard birthday invitation card. Also, creating handmade chalkboard invitations may require you to spend more money for buying scrapbooking or crafting materials. This is especially true if you want a realistic chalkboard card cover by buying specialty paper textures and other embellishments. 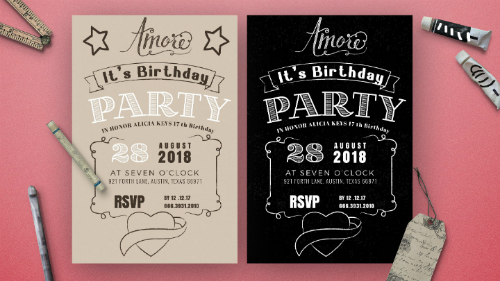 Chalkboard birthday invitation templates are pre-formatted digital files that already include all the text and graphic design elements needed to create a birthday invitation template that follows a chalkboard theme. These pre-made printable templates are considered a better alternative to creating birthday invitation cards by hand since you do not have to create the invitation template from the ground up. Another advantage with using pre-made birthday invitation templates is that you can both have a well-designed birthday invitation card without having to spend much for it. Pre-made birthday templates usually only cost a few dollars. With this card-making method, you can also mass produce your chalkboard invitation cards and invite as many people as you want to your birthday bash. 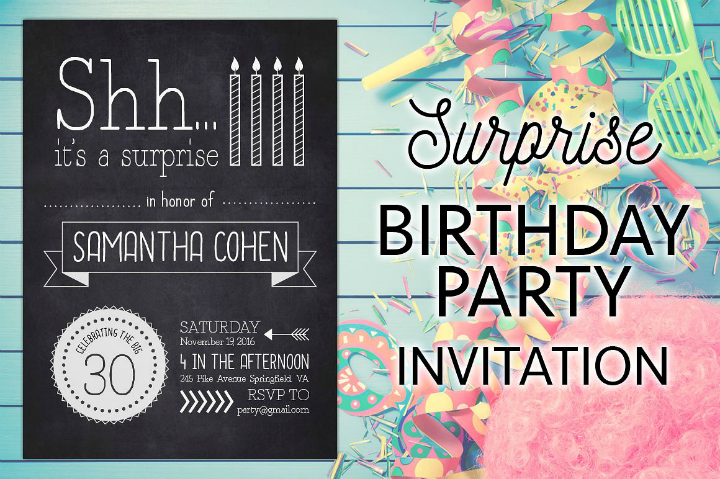 The downside of using pre-formatted chalkboard birthday invitation cards is that you may need to learn how to use graphic design software programs in order to personalize the template of your choice. Note that this is only a minor disadvantage which can easily be resolved by choosing printable birthday templates that allow customers to request for edits made by the template’s original creator. Now that you know the different ways on how to create a chalkboard birthday invitation card, you are in a much better place to decide what card-making approach to use. If you want to read a step-by-step guide on how to create an invitation or greeting card, check out this ultimate card-making guide. How to Choose a Chalkboard Birthday Invitation Template? 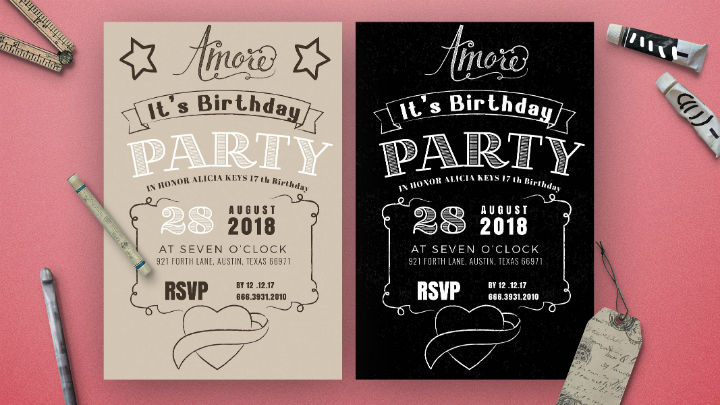 Just like looking for wedding templates, searching for the right chalkboard birthday invitation template design can slightly leave you overwhelmed with the myriad choices available for you. After all, birthdays are the most common celebrations or events that warrant the use of invitation and greeting cards. The first factor to consider when choosing a chalkboard birthday invitation template is, of course, the birthday celebration theme. Having themed birthday celebrations is very common for children’s birthday parties. Sometimes, adults also choose a theme or motif for special milestone birthdays like Sweet Sixteen, Debuts, and 50th birthday celebrations. Chalkboard card designs can work well with any event theme or motif since the chalkboard background can act as the canvas on which your other theme elements can rest on. So when you are going to choose an invitation card template for a superhero themed birthday party, you should pick an invitation template that already incorporates different superhero fonts styles, illustrations, images set up against a chalkboard background. And if you want a more elegant and formal invitation card template design, you can choose a chalkboard invitation that sports elegant floral or geometric elements. 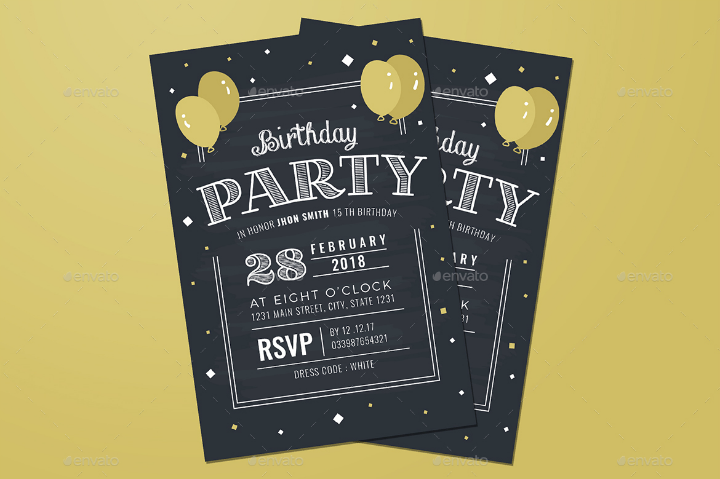 The next thing to factor when selecting a chalkboard birthday invitation card template is the amount of money needed for purchasing the invitation card template and for printing out the invitation cards later on. This is an essential aspect to consider especially if you are following a simple budget. It is true that most printable birthday templates only cost between a few dollars. However, as the birthday event planner or organizer, you should also factor in the cost of printing the invitations. Some invitation card templates may require specialty papers or a different printing mode. All of these options may cost additional money. The total printing cost may also increase if you are having a big party and if you want to print a lot of invitation cards for all your guests. Consider all these things prior to choosing a chalkboard birthday invitation so that you will not be caught off-guard with the burgeoning printing costs later on. 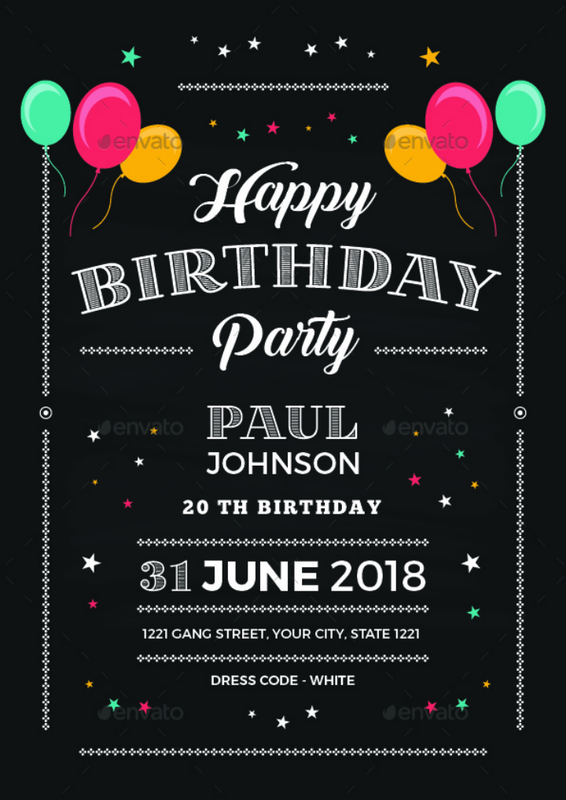 Most pre-made birthday invitation templates will require you (the end-user) to make edits on the template after purchasing it. These edits typically include adding the birthday party details on the template or replacing stock images with your own photos. 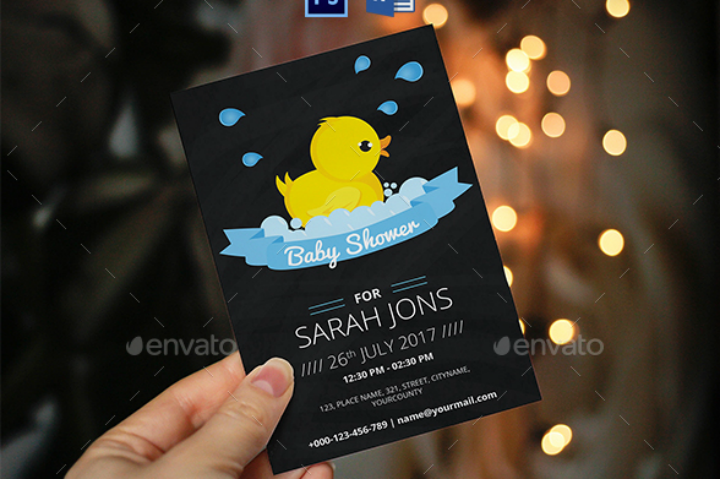 And, if you wish to also add more design elements to make the entire invitation template look more unique, you will need to that by yourself too. All these tasks will take time. You should factor in the amount of time you need to learn the basics of graphic design software and editing if you are starting as a beginner. And whether you are planning to make these changes yourself or delegate it to someone else, you should carefully think about how much time the task would take prior to purchasing the invitation template. This is important because you need to send out the birthday invitation cards a couple of weeks before the birthday event. Another factor to consider when looking for a chalkboard birthday invitation template is your own graphic design skills. As we have mentioned earlier, most pre-made birthday templates will need the end-user to have a little graphic design and editing knowledge since they are required to make minor customizations on the template. If you are not confident with your editing skills, it may be best to look up different Illustrator or Photoshop tutorials before purchasing the invitation card template. You may also choose a chalkboard invitation template that requires less editing so that you will not have to spend a lot of time customizing it and exhausting your own set of skills. Also, an alternative will be to delegate the task to someone else. 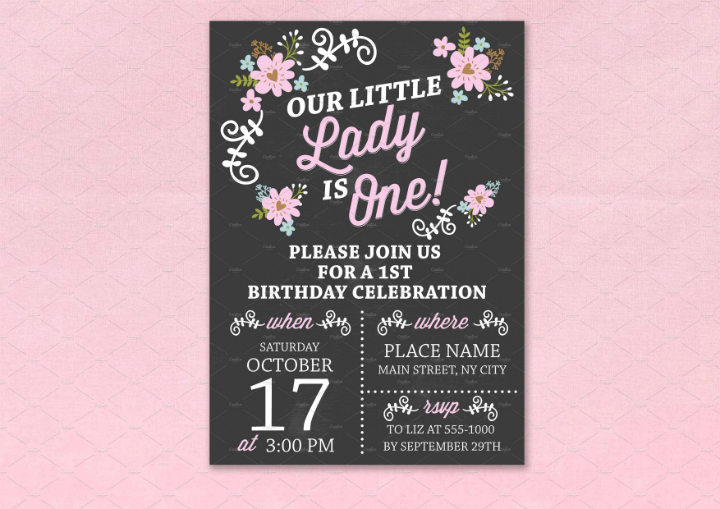 By considering your own editing skills prior to purchasing the template, you will have already formulated a plan on how to have a completed and ready to print chalkboard birthday invitation card template without stressing too much over the entire process. 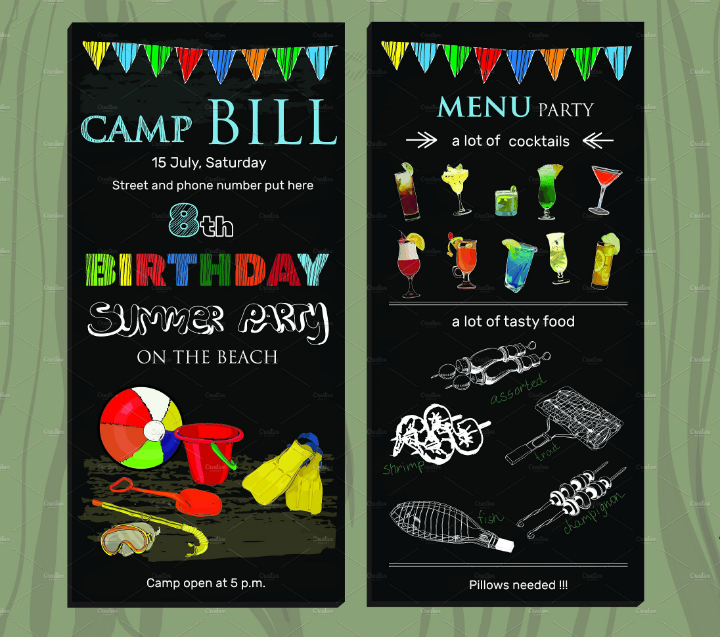 For more tips on how to design your own party invitation, check the linked article. The birthday invitation card template selection guide we have presented above is not a clear-cut set of rules to follow. You still need to carefully weigh in on all these things before finalizing your decision on what chalkboard birthday invitation card template to purchase and use. Use your own instincts and you will be on your way to creating the best chalkboard birthday invitation card. Truth be told, it is very hard to find a truly distinctive chalkboard birthday invitation card design mainly because all these invitation cards will sport the same chalkboard background and design elements. So, if you want to have a unique birthday invitation card design, you should be ready to go the extra mile in personalizing the template that you have chosen. You may have to learn more about graphic design and editing through different Photoshop or Illustrator tutorials before you can truly transform a printable card template design. Nevertheless, just remember that the best chalkboard birthday invitation is the one that was created with all the love and compassion for the person celebrating his or her birthday. You may also see kid’s birthday invitation templates. 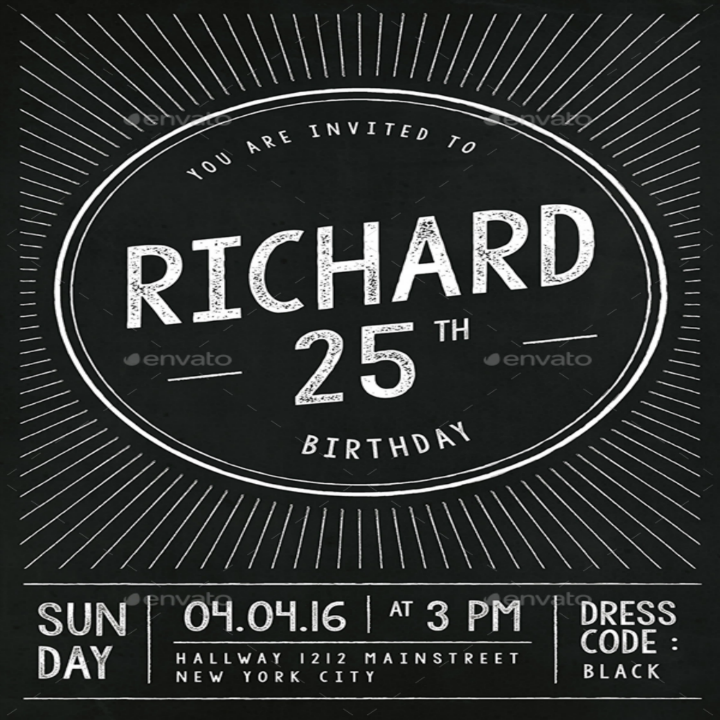 If you want to share this collection of beautiful chalkboard birthday invitation card templates to your family, friends, and colleagues, do not forget to post this on social media or send the article link through email.